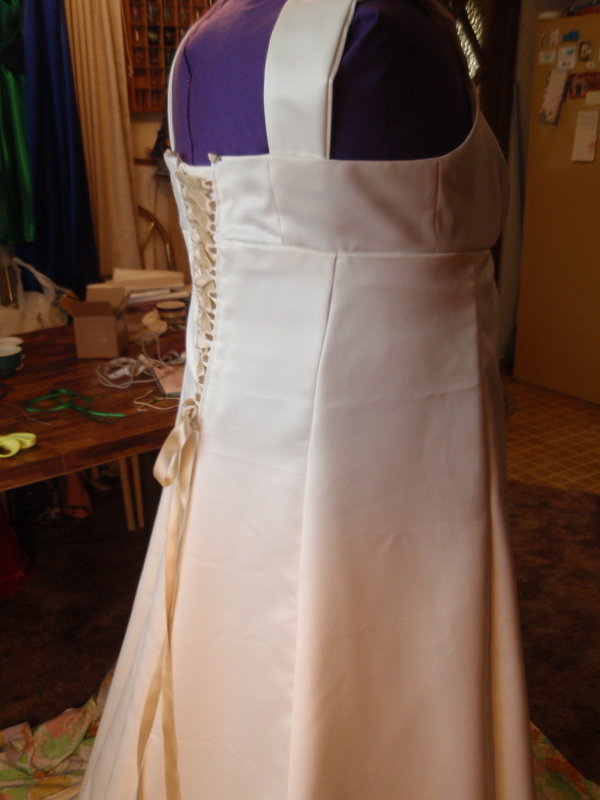 Yes, it has been quite a while since I have posted a blog about my wedding dress, but the simple fact was that I wanted to keep the end creation a secret until my wedding. I altered my design as my wedding date loomed closer and eventually ended with two different looks (or actually three….) and I was very happy with the finished product. 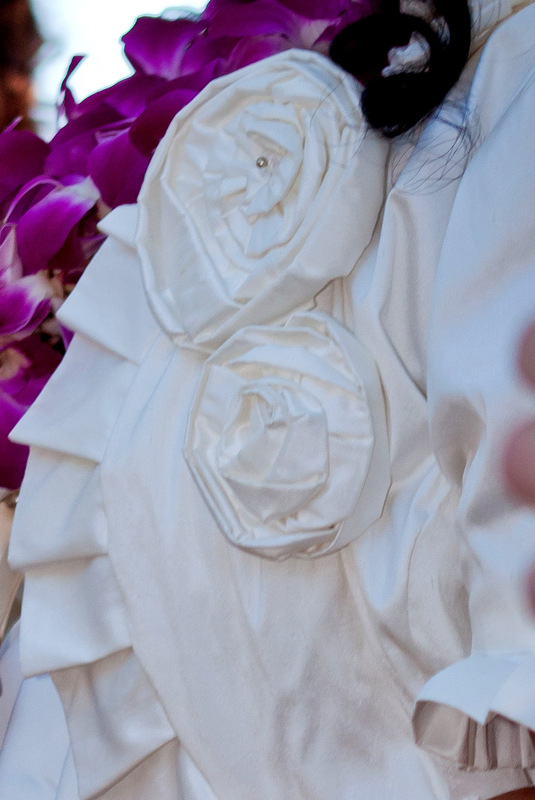 My wedding gown is a late-Edwardian style gown with Art Nouveau details made of ivory peau de soie satin and silk chiffon with silk satin ribbons and vintage pearls. 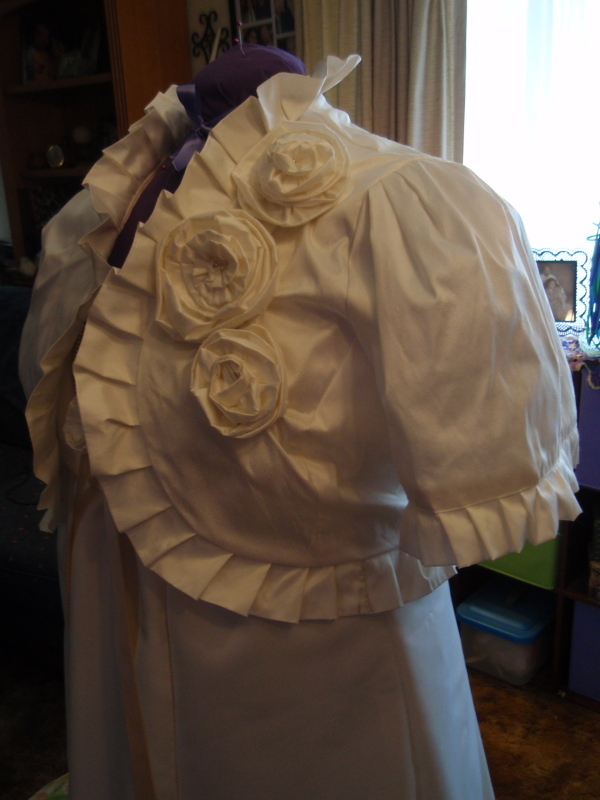 The main inspiration for my dress is one of my favorite gown designs – Rose’s “swimdress” from the Titanic. I love the robe overdresses of the Edwardian era. 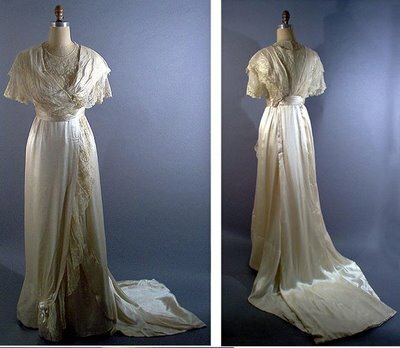 This dress is reminiscent of an Edwardian teadress and to me, is gorgeous in it’s simplicity. 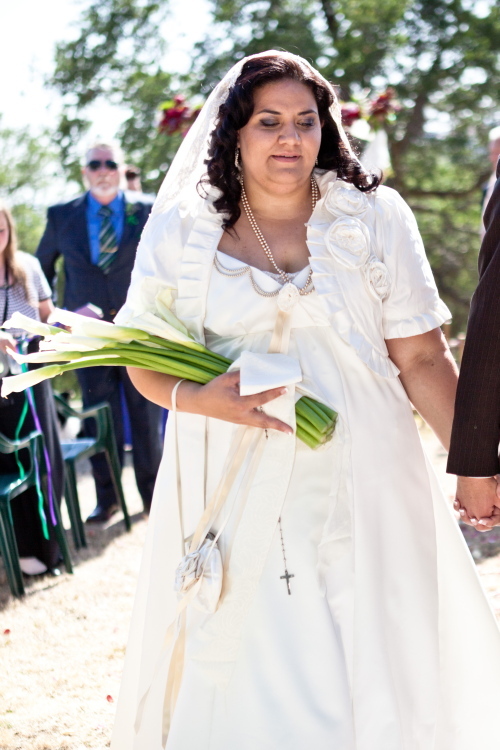 But I veered a bit away from my original vision and chose a different look for my wedding day. This is my wedding gown. 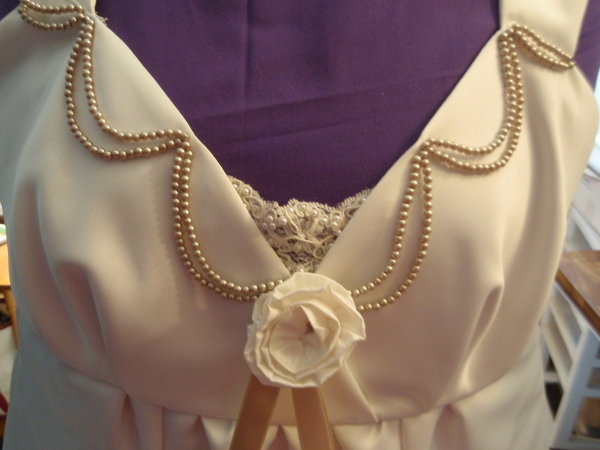 It is ivory peau de soie heavy satin with a beaded French Alencon lace insert on the bodice (the same lace as my veil), a rosette of silk dupioni and silk satin ribbons. 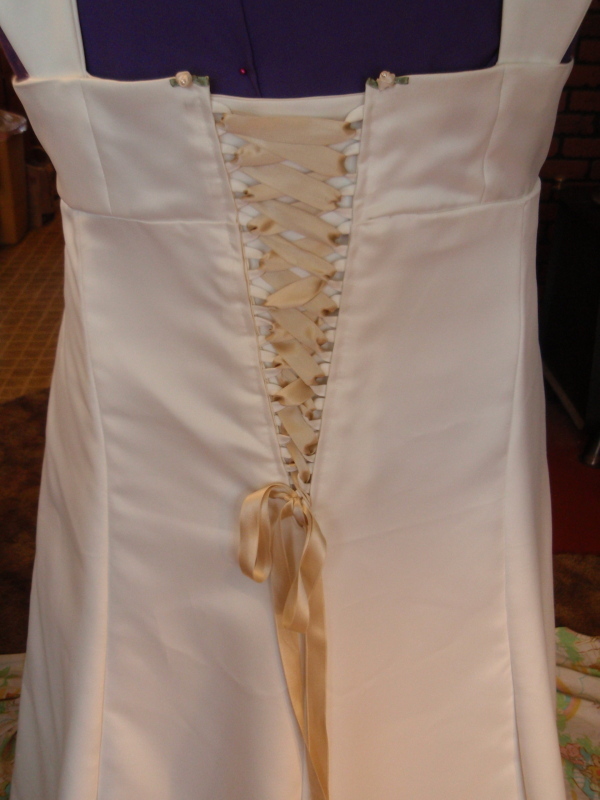 The back of wedding gown features a corset back with silk satin ribbons. 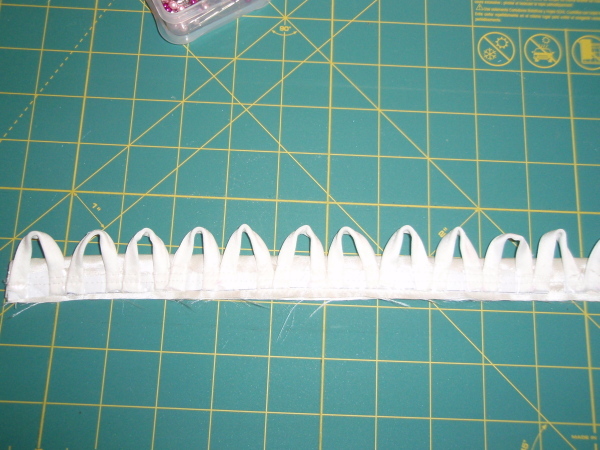 I also added two little rosettes on the top edges. 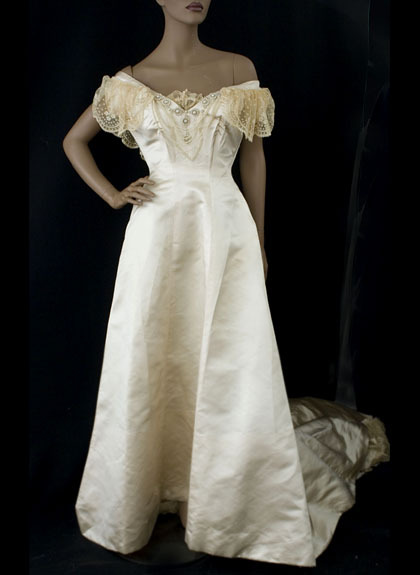 And then I saw this gown on vintagetextile.com and knew that I had to have some pearls….. 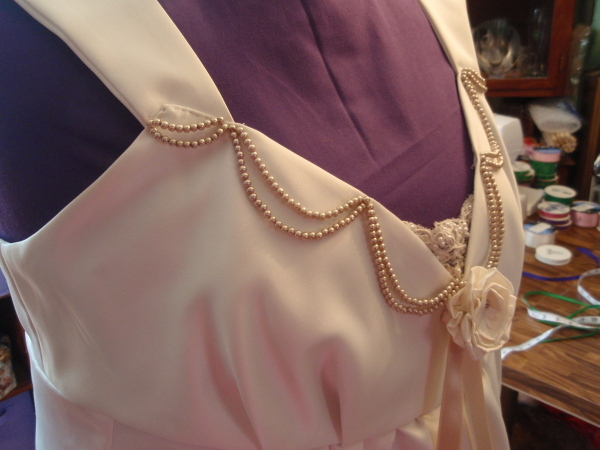 I had decided to wear a strand of my grandmother’s pearls with my wedding ensemble and knew that this would work well. Oh pearls….. love …. love …. love…. 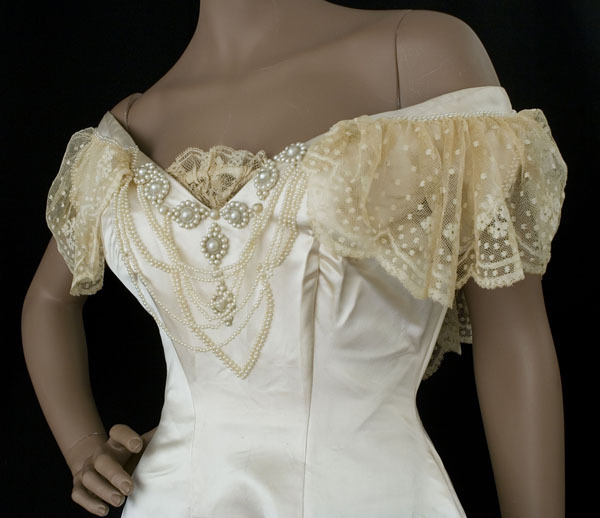 So going along the lines of this Edwardian gown for my inspiration, I added swags of pearls to the bodice, exactly matching the set of vintage pearls I would be wearing on my wedding day. 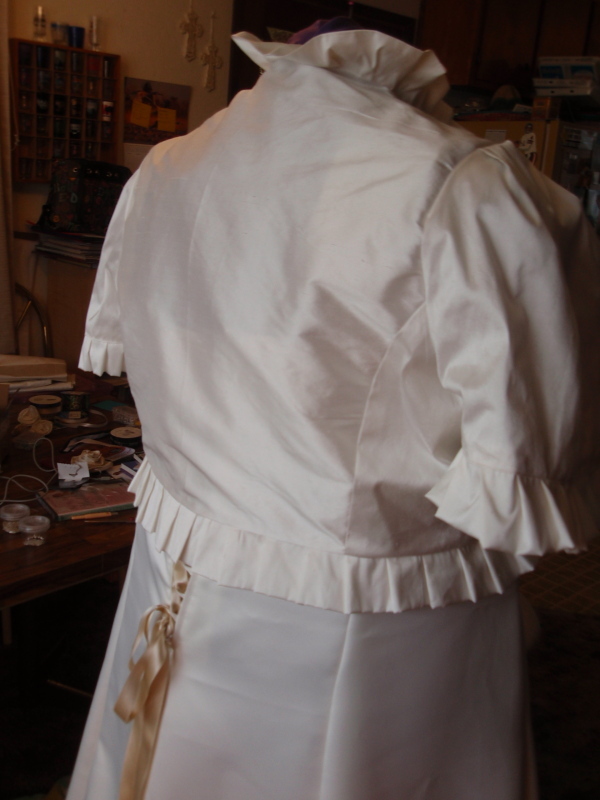 And then a major modification was this silk dupioni bridal bolero jacket that I made and loved so much that I opted to wear it with my gown rather than the original overdress that I had designed and created. 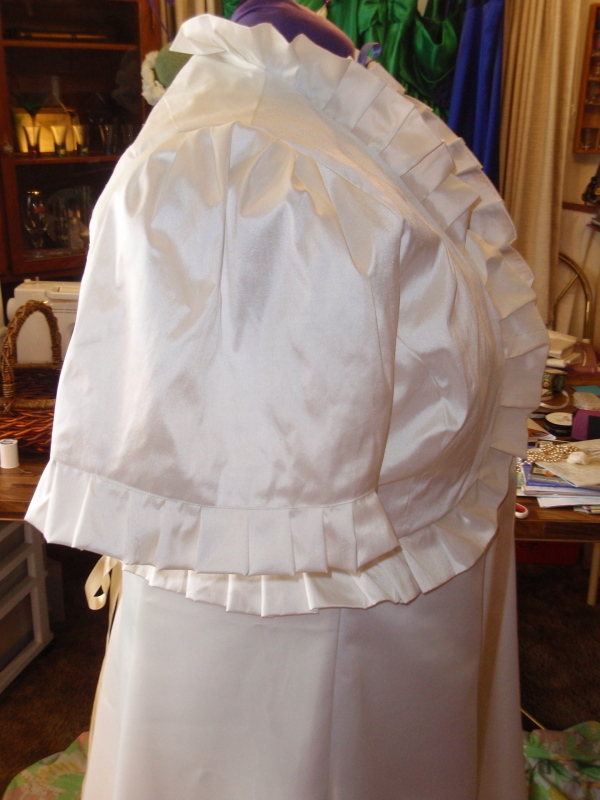 It has ruffled edges reminiscent of Victorian and Edwardian fashion, rosettes and pearls in the rosettes and is lined with satin. 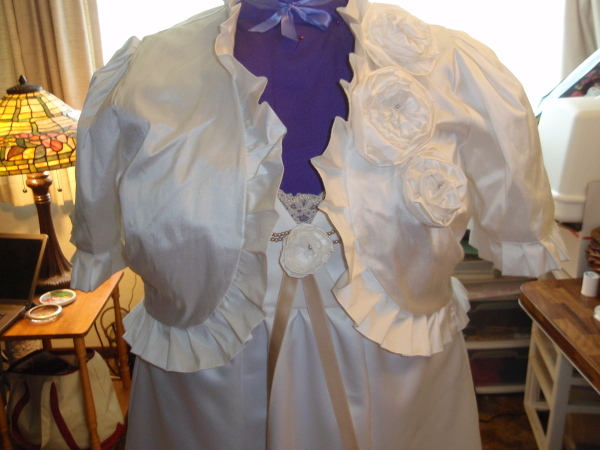 Originally I was going to wear my overdress for the ceremony and then change into my jacket for the reception, but after making the jacket and trying it on with my dress, it was definitely what I wanted. 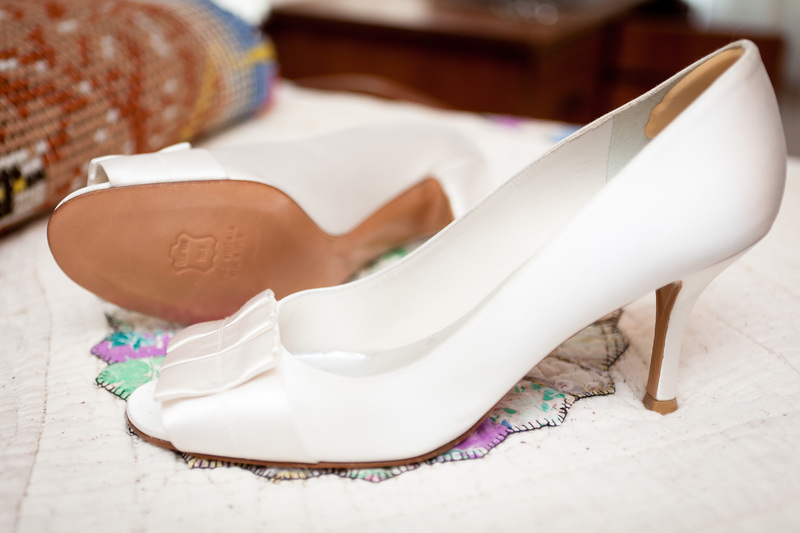 I wore my wedding gown with these Stuart Weitzman heels…. And then changed into a pair of Jimmy Choo sandals for the reception. 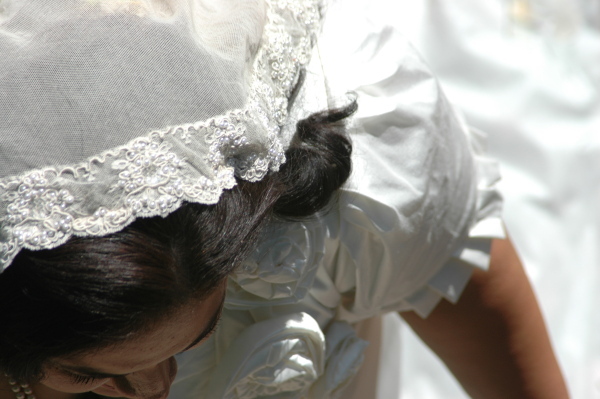 And here is me in my wedding gown with my handmade ensemble, including my handsewn English cotton net and French Alencon lace mantilla veil. 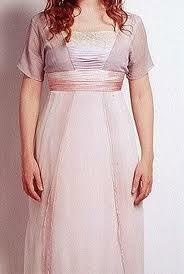 But I did end up wearing my overdress as we had some family photos taken after our wedding. 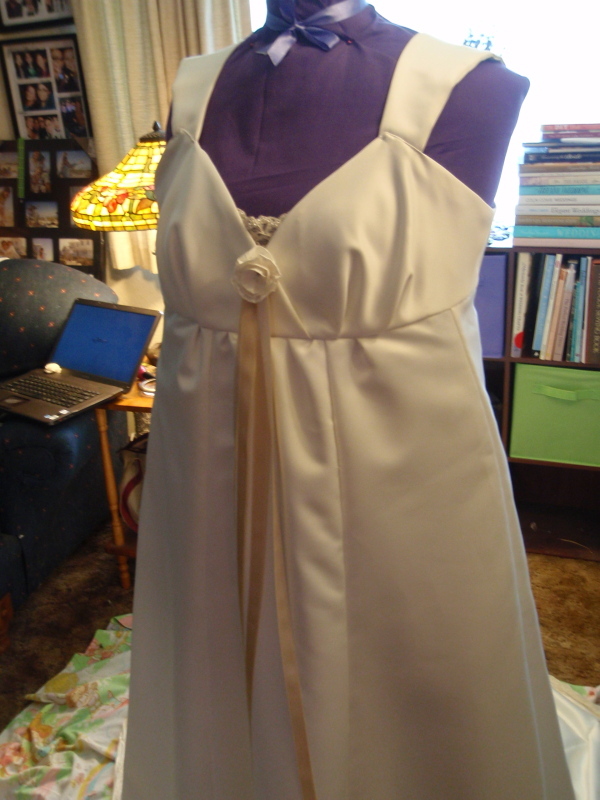 I just found your site and I’m so impressed that you made your dress all yourself! 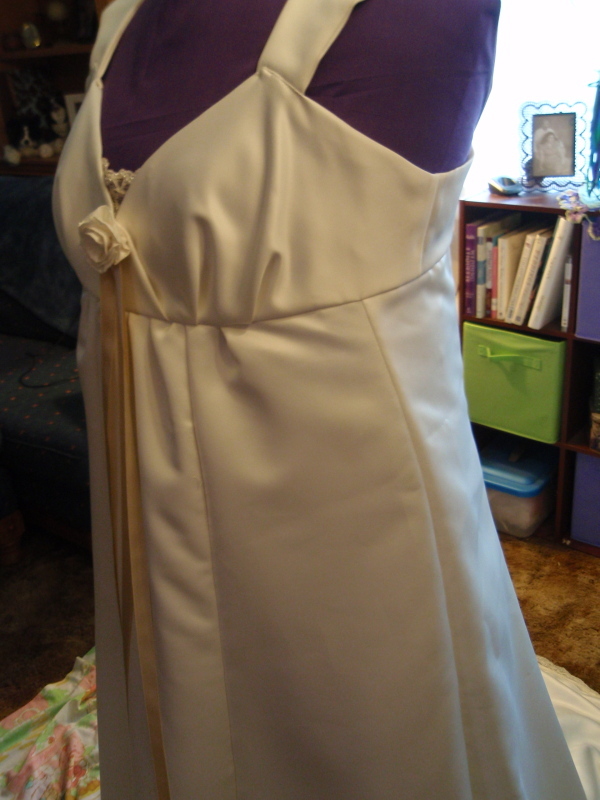 great job on the dress! you looked beautiful!